A Balanced diet is that diet, which fulfills your nutritional demands of the body and maintain the proper functions of tissues and organs. It contains vitamins, minerals, carbohydrates, protein, fats in balanced quantity. Following a balanced diet plan will make you active, healthy and happy. 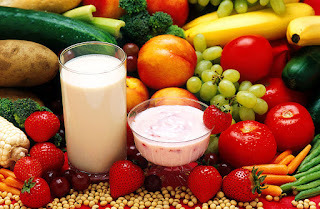 It is not same for everyone and depends upon your age, gender, illness and your daily physical activity.Balanced diet involves a wide variety of foods like fresh fruits, fresh vegetables, cereals, nuts and many more. In a healthy diet vegetable, fruits, whole grains, and nuts should be included. Free sugar consumption should be limited. Limit salt intake from all sources and salt should be iodized in proper proportion. Why a Balanced Diet is Important? Eating a healthy balance diet help you in maintaining a healthy weight and keep you away from many dangerous diseases like diabetes, hypertension and heart diseases. Its improve your lifestyle and overall health. Besides these benefits, it also improves your mood. A Study suggests that eating high sugar processed food, processed meat and fast food linked with increased risk of depression, mood disorder and anxiety. Eating nutrient rich food and avoiding high sugar, high salt and processed food will improve your mental health and mood. Component of a Balanced Diet? A Balanced diet does not mean that you do not have to eat food from a particular group, or depriving yourself of the food that you love. It means that you have to eat foods of all varieties. Animal products like meat are rich source of proteins and plant products like vegetables, fruits, whole grains and nuts contains less protein as compared to animal products this is the reason why vegetarians don't get enough proteins. But it can be compensated by adding a wide varieties of vegetables and fruits in the diet. According to US department of agriculture above the age of 19 years we require 0.8 gm protein/kg of body weight. It is essential for muscle growth, repairing of nerves and healing injuries. Your main source of carbohydrates must be from brown rice, oatmeal, wheat, potatoes, fruits and other unrefined carbohydrates and not from white bread, white rice, pastries, pizza like refined carbohydrates. Refined carbs are reasons for weight gain and many health problems and provides no nutritive value (empty calories). Fats can be divided into two parts based on the effect on our body - good fat and bad fat. Bad fat can impair your diet and increases the risk of many diseases like heart Disease. Monounsaturated and polyunsaturated fat are considered as good fats because these decreases cholesterol levels and reduces the risk of heart disease. An Omega-3 fatty acid type of polyunsaturated fats is particularly beneficial for heart disease and in lowering blood pressure. Fishes like salmon, herring, trout are rich sources of Omega-3 fatty acids. These micronutrients play important role in metabolism, nerve and brain functions, bone development. Fruits and vegetables are the main source of vitamins and minerals.